Coeur Mining is the largest U.S.-based primary silver producer and a significant gold producer with five precious metals mines in the Americas employing approximately 2,100 people. Coeur produces from its wholly owned operations: the Palmarejo silver-gold mine in Mexico, the San Bartolom� silver mine in Bolivia, the rochester silver-gold mine in nevada, the Kensington gold mine in Alaska, and the wharf gold mine in South Dakota. 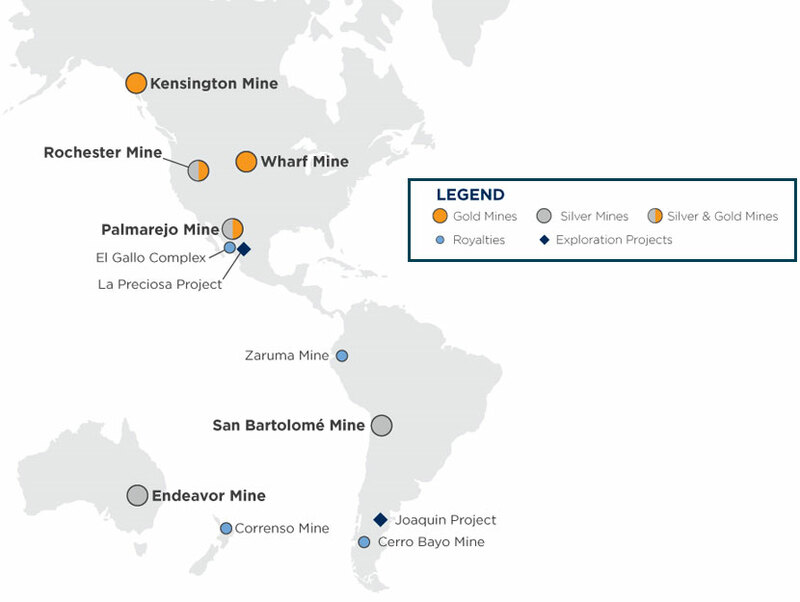 The Company also has a non-operating interest in the Endeavor mine in Australia in addition to royalties on the Cerro Bayo mine in Chile, the El Gallo complex in Mexico, the Zaruma mine in Ecuador, and the Correnso mine in new Zealand. in addition, the Company has two silver-gold exploration stage projects - the la Preciosa project in Mexico and the Joaquin project in Argentina. The Company also conducts ongoing exploration activities in Alaska, Argentina, Bolivia, Mexico, and Nevada. The Company owns strategic investment positions in several silver and gold development companies with projects in North and South America. Coeur Mining Inc. operates the Kensington gold mine in Alaska, the Rochester silver-gold mine in Nevada, Wharf Gold Mine in South Dakota, the Palmarejo silver-gold mine in Mexico and the San Bartolomé silver mine in Bolivia. Coeur also owns a non-operating interest in a silver-base metal mine, Endeavor, in Australia. Safety Administrative Assistant, AK, USA Hot! Assay Supervisor, BC, Canada Hot! Mill General Foreman, AK, USA Hot! Crusher Maintenance Tech 1, SD, USA Hot! Senior Mobile Maintenance Planner, NV, USA Hot! Miner 3, BC, Canada Hot! Miner 4, BC, Canada Hot! Machine Lubrication Analyst, AK, USA Hot! Temporary Haul Truck Operator, AK, USA Hot! Paste Plant Operator, AK, USA Hot! Senior Mine Accountant, NV, USA Hot! Administrative Coordinator, AK, USA Hot! Manager, Financial Reporting, Chicago, IL, USA Hot! Fixed Maintenance Planner, AK, USA Hot! Senior Health and Safety Coordinator, NV, USA Hot! Site Services Trainer, BC, Canada Hot! Haul Truck Operator 1, SD, USA Hot! Process Trainee 1, SD, USA Hot! Project Accountant, SD, USA Hot! Mill Maintenance Mechanic, AK, USA Hot! Treasury Analyst, Chicago, IL, USA Hot! Project Engineer, AK, USA Hot! Mobile Maintenance Mechanic, NV, USA Hot! Warehouse Operator/Technician, AK, USA Hot! Permitting Manager, Nevada, NV, USA Hot! Vice President, Operations Support & Technical Services, Chicago, IL, USA Hot! Mine Maintenance Mechanic, AK, USA Hot! Tax Analyst, Chicago, IL, USA Hot! Senior Project Engineer, NV, USA Hot! Mine Planning Engineer, NV, USA Hot! Alaska Permitting Manager, AK, USA Hot! Mine General Foreman, SD, USA Hot! Environmental Technician, BC, Canada Hot! Project Superintendent, BC, Canada Hot! Cost Accountant, Juneau AK, USA Hot! Laboratory and Data Coordinator, NV, USA Hot! Warehouse Supervisor, NV, USA Hot! Senior Accountant, NV, USA Hot! IT Technician, AK, USA Hot! Senior Manager, Exploration, Chicago, IL, USA Hot! Mine Geologist, Nevada, USA Hot! IT Technician, Nevada, USA Hot! Haul Truck Operator, Nevada, USA Hot! Mine Maintenance Mechanic, Alaska, USA Hot! Fixed Plant Maintenance Mechanic, Nevada, USA Hot! Community Relations Specialist - Permitting, AK, USA Hot! Operations Manager, AK, USA Hot! Geo Technician, AK, USA Hot! Stockpile Technician, British Columbia, Canada Hot! Heavy Duty Mechanic, British Columbia, Canada Hot! Millwright, British Columbia, Canada Hot! Electrician, British Columbia, Canada Hot! Bolter/Miner 2, Northern British Columbia, Canada Hot! Miner 3, Northern British Columbia, Canada Hot! Mill Maintenance General Foreman, Alaska, USA Hot! Chief Metallurgist, South Dakota, USA Hot! Haul Truck Operator / Utility 1, South Dakota, USA Hot! Fixed Maintenance Planner, Nevada, USA Hot! Project Superintendent, British Columbia, Canada Hot! Environmental Manager, British Columbia, Canada Hot! Maintenance Trainer, British Columbia, Canada Hot! Project Engineer, British Columbia, Canada Hot! Site Services Planner, British Columbia, Canada Hot! Mobile Maintenance Supervisor, British Columbia, Canada Hot! Underground Miner, Alaska, USA Hot! Fixed Plant Maintenance Supervisor, British Columbia, Canada Hot!